Botanical name : Eucalyptus Globulus. Origin : Australia and China. Scent : Has a fresh, camphorous aroma with a hint of peppermint! This essential oil is extracted from the leaves by steam distillation. Eucalyptus can blend well with basil, lavender, lemon , peppermint, rosemary and tea tree. 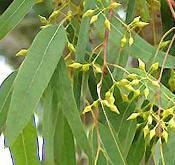 Eucalyptus is a family of flowering trees. The notable commonality among the members of this family is the scent that is minty. The scent varies from each specie but still does not lose the common scent quality just the intensity. There are three species of this family that is used in aromatherapy are: E. Globulus, E. Radiata and E. Citriadora. The first has the strongest scent and more raw. The second has a less intense scent than E. Globulus. The third kind is somehow different from the others due of the hint of citrusy-scent it has. The oil when applied will feel cool to the skin which is one of the distinct character of any eucalyptus infused substances. Learn More about Eucalyptus Aromatherapy. More information on Eucalyptus Citriodora. Eucalyptus oil may irritate sensitive skin; and do not use on babies or young children.